1215 1:72 UH-19A, the artwork shows a USAF Rescue aircraft equipped with floats. 1218 1:72 MH-47E SOAR Chinook, long range fuel tanks, extended nose, refuelling boom & radar pod. The 1:72 Gazelle announced at the Chicago fair late last year (HKN #110) is now not listed. 4468 1:72 EH101 RAF Merlin MC.3 should be a substantially different shape compared to the Italeri HM.1, as this version has a rear-loading ramp, as does the Canadian Cormorant. 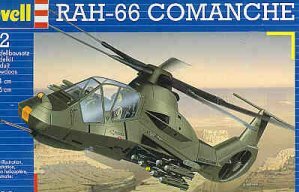 4469 1:72 RAH-66 Comanche, the Italeri kit re-boxed, now released. 4457 1:72 EC.135 'ADAC', this was originally scheduled for last year but reportedly shelved due to mould problems. It does not appear in the Revell website catalogue, but it was reportedly listed at the Nuremberg show for issue in the second quarter of 2001. 4470 1:48 RAH-66 Comanche, again it is believed this will be the Italeri kit re-boxed. 3083 Westland Navy Lynx Mk.8. The old Lynx HAS.2 kit updated. 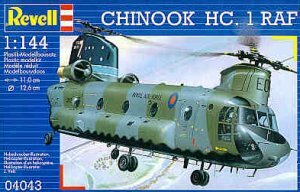 5030 RAF Chinook HC.2, plus Spanish markings, Airfix's first Italeri re-box. Airfix have deleted the Lynx HAS.2, the Seasprite, and the Belvedere, so get them while you can. 5. Fonderi 1:48, Sikorsky R5 / HO3S-1. Nothing more known about this at present, except that the maker is French. 6. Minicraft 1:48, #11629 UH-60 Blackhawk, U.S. Customs 'Cokebuster' / Pot Hawk'. This could be a very plain black or olive drab scheme, or it could be one of the much more interesting gloss black and gold schemes with Marijuana & Coke leaf 'kill markings'. Decals for this scheme in both 1:48 and 1:72 were provided on a decal sheet issued by IPMS USA for their Silver Anniversary Nationals, accompanied by a write-up from Pete Harlem. 8. Hawkeye Models and The Aviation Workshop have formally joined and in future will be called Model Alliance. The numbering will be changed and a new catalogue is being prepared. 9. It was noted in HKN #115 that the recent Azur Cierva C.30 kit #015 contains decals and modified tail surfaces for a LeO C.30 operated by the French Navy. Some LeO-built C.30's also had modified undercarriage and other detailed differences as well as the conspicuously different Salmson engine. However, the decal option in the kit may apply to an Avro built C.30, originally G-ACWI, later F-AOIO, which had a Genet Major engine and was delivered to LeO in 1934 before they started their own construction programme (LeO themselves used the Genet Major engine as well as the Salmson in their C.30's). So on the face of it you can safely build the kit with the French markings, however, note that the markings "352.1" may be incorrect in that the machine served with Flotille 3S-2 and thus I assume the markings should be 3S2.1. Given that Azur have provided the modified tail surfaces for a Salmson-engined LeO C.30 but tell you not to use them, maybe we'll be seeing another variant of this kit with a Salmson engine sometime in the future ? 10. 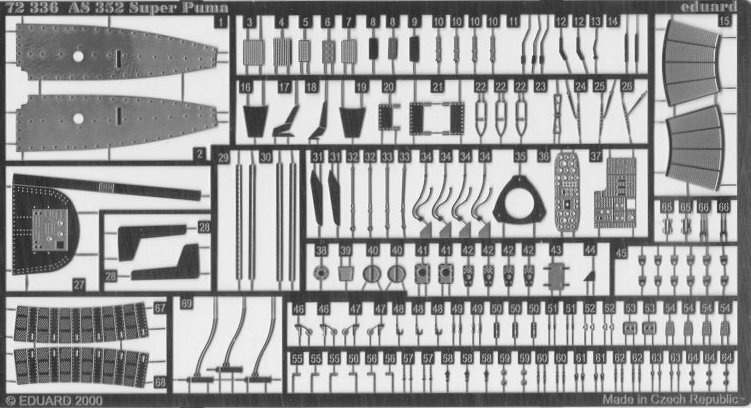 The recently released Eduard brass set for the Italeri AS.332 Super Puma contains more tiny parts than I have ever seen on any brass set for a helicopter before. It's debatable how many of them are actually useable ! 11. 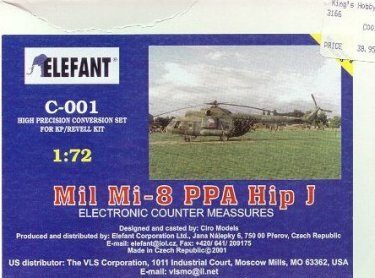 Verlinden are distributing a resin and brass Mi-8/17 'Hip-J' conversion for the KP kit under the 'Elefant' label. This turns out to be the Ciro conversion set #C-001, but with with the price DOUBLED. Too many middle-men getting a cut at the modeller's expense it seems. Seek out the Ciro original (HKN #107). 12. In Japan, Rainbow Ten are selling a Tamiya re-box of the Italeri A.129 Mangusta, #60758. 72136 Ka-25 'Hormone' for the Sky-High kit, would also fit the Airfix. Thanks to Geoff Arnold, Tony Morgan, Gary Madgwick, & Gregorz Gembala.